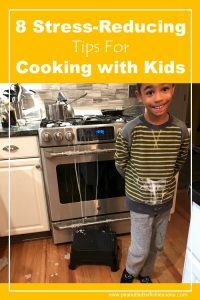 Do you like to cook with your kids? I do and I don’t. I mean sometimes it goes well and is such a fun experience and other times my eye is twitching and everyone ends up grumpy. Recently, we had an ‘incident’ (see picture below) that ended with a huge mess in the kitchen. One of those messes you are still cleaning up days later. Luckily, we were all in the mood to laugh about it, but I knew on another day it could have sent me to my bed for the rest of the day. Kidding, not kidding. I knew then I needed to make a mental checklist of ways to make our cooking experiences go smoothly.. Here is that mental checklist. 1. Make sure everyone is in the right mood. Let’s face it. We all know we have days where we are feeling a little irritable. And there are definitely days our kids are irritable. Don’t cook together on these days! Just don’t do it. It will not be a fun, learning experience. Wait until another day. You may also find certain times of the day are better for you all to cook together. Go with those! 2. Have children take turns. 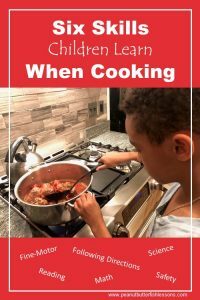 You may have one help with one dish or part of a recipe and have another child help with another part of the recipe so that not all of your children are in the kitchen at the same time. Or you may have them in there together and just have alternate steps. This is going to depend on how many children you have and all of your personalities. I tend to get overstimulated easily so less kids in the kitchen at a time is important for me! It is helpful to have children at the right height at the counter. It will keep them from climbing on the counter. Even with older children, I find the step stool helps them see what they are doing better, which means less mess. If your children are the past the usual age for step stools, a simple 9 inch stool like the one below works great. 4. Read through the whole recipe first. Besides seeing what ingredients and steps are involved, make note of how much time it will take to make the recipe and what downtime there may be such as time for the food to marinate or set in the refrigerator. This way you can help plan your children’s time appropriately, since we know children don’t like waiting around! 5. Get all the ingredients out first. 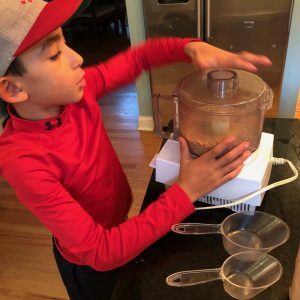 I rarely get all of my ingredients out before starting to make a recipe when cooking by myself, but find it much easier to have everything in hands reach when the kids are with me. Sometimes I don’t want to turn my back on my children to get something from the pantry! I usually read the list of ingredients and have the kids grab them. Nothing gets my eye twitching like children near an open flame or with a knife in their hands! Decide which tasks you are comfortable with your child doing and let children know which ones you will be doing for them. You may want to pick one “dangerous” task per cooking session that you can give them extra training on so that they can become safely independent with it. Some children prefer repetitive tasks where they can build competency and feel successful and some children like to regularly take on novel tasks. Assign them a task that fits their personality. One of my buys loves to peel potatoes and crack eggs and he will do this over and over again. But, he doesn’t necessarily want a bunch of different tasks to do during one cooking session. My other guy is the exact opposite. He wants to do something once or twice and then move on to something else. Remember that cooking together should be fun. Maybe put on some music. Let the children use “power tools” such as the blender, food processor or electric mixer. (Pay attention to safety concerns, of course!) Let everyone lick the spoon! Do you have anything you do to keep cooking with your kids low stress? Comment below! Interested in counting your cooking as ‘school’? 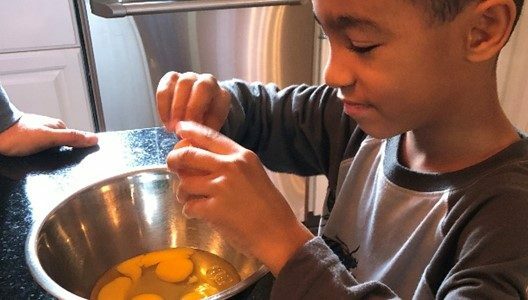 Read Six Skills Children Learn When Cooking.